Einstein is the internal customer service application used by call center agents of a large cable company to manage the billing, services and support of customer accounts. Redesigning the internal customer service application used by Call Center Agents of a large cable company to manage the billing, services and support of customer accounts is no small feat. Together with a team of 2 UX designers, 2 research focused designers and an intern, we implemented everything from end-to-end user flows, wireframes and documentation to visual design. We worked side-by-side with product owners and dev teams to ensure feasibility and execution. I jumped into this project as two lead UX designers were moving onto other projects and picked up right where they left off. Because of the scale of this application, specific flows were focused on by various designers on the team — Authentication, SmartStart and the Interactive Troubleshooting Guide were areas I focused. To gain a better understanding of how Einstein was used across the company, we went on various truck-rolls with technicians and sat side-by-side with agents in the call-center. Below are three of the specific experiences within Einstein that I focused on. 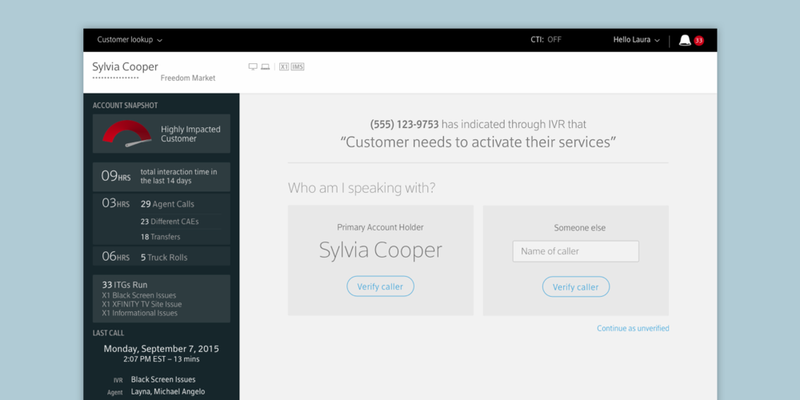 This is the flow for authenticating a customer when speaking to a call-center agent. Einstein allows agents to make changes to a customer’s account; therefore, agents are required to verify customer’s information prior to accessing their account. With information scraping and identity fraud being a high-risk extremely sensitive topic, an authentication flow ensuring a customer’s identity and uniformly taking all methods of verification used across the enterprise into consideration was created. By streamlining and making a consistent process for verifying customers we balanced security and efficiency. In addition to customer verification, the agent had access to a description of the issue the customer provided through the Interactive Voice Recognition system. This call context helped the agent start the call more effectively. During my side-by-side's with agents, I watched as they wrote on sticky notes or notebooks next to their computers or typed in an open note pad on their computer to jot down sensitive customer information and notes before jumping into the servicing application. The need to improve the verification process of our customers was startlingly obvious. In order to do this, I needed to understand everything about the authentication flow and experience. How did the customer get to the agent from an internal perspective? What were the steps the customer took to get to the agent? How did the agent get to the customer's account if the customer didn't provide any information? Etc. etc. etc. Many questions of this nature were asked. The most important step to understanding the complexity of the authentication process was to create a user flow full of what-if's. I poked many holes in the process to gain a better understanding of this painful customer experience. Many questions were brought up to the product owner and dev leads for clarification. To create a simplified experience, all the functionality and limitations needed to be fully understood. Many hours were spent asking and creating edge-case scenarios to better understand security risks. In trying to empathize with both the customer, the business and the agents, we started by analyzing the experience of how the customer got to the service agent. Having a better understanding of the information collected through the IVR (Interactive Voice Response) gave us insight into the information the agent needed to be aware of or information that would need to be collected, and in which phase of authentication the customer was in upon landing with an agent. While our focus was on the future state of the Einstein application, the legacy platform still needed to be maintained and remain compliant for legal standards. This meant that the authentication flow needed to be implemented for both legacy and future states. No documentation had been created so I jumped on the opportunity to create the source of truth for this high security flow while creating the wires. This is a small sample of the 70+ page document that included dev requirements, documentation, and design specs. I worked very closely with the product owner and dev leads with guidance from the security team to ensure feasibility and compliance. After analyzing the in-depth user flow, we broke down the verification process into three main screens: 1. Verify the caller 2. Verify the correct account/address and 3. Verify the customer's identity through NPI (Non-public Personal Information). 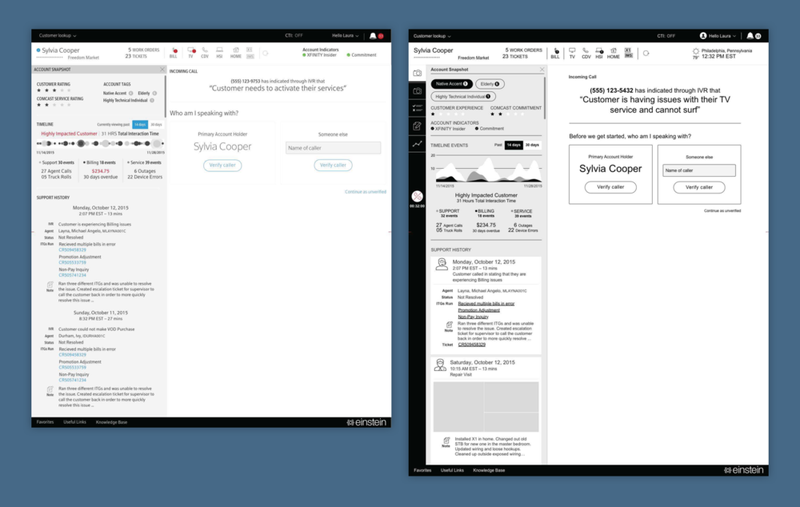 From the wireframe we moved onto implementing the legacy platform and then onto the next generation servicing platform which aligned to design standards being used for other applications within this large cable company. Agents use this flow over 2 million times a day. Initially, the AHT (Average Handle Time) for agents increased but as agents became more accustom it quickly began to normalize. By implementing this flow, we streamlined a manual process to increase the security of accounts in addition to the effectiveness/efficiency of agent calls. We reduced swivel to other tools, reduced manual errors and increased compliance. We also allowed agents to standardize the start of the call and take control of the conversation. Throughout the lengthy discussions of the Authentication flow, we constantly asked what information the agent might need to begin the conversation, get the conversation started and resolve the reason for the call more quickly. This ongoing discussion led us to investigate tools and features that would be more informative to the agent. Working with internal teams focused on creating a more dynamic call context, we began iterating on how a predictive API would influence the experience for our agents, give a holistic view of the customer and get the call started. We also engaged with a team focusing on historic information to begin looking at predictive servicing. This was an investigative and conceptual exercise. This exploratory effort drove the direction for the current day call start experience. This is the flow for the Interactive Troubleshooting Guide used to walk an associate through diagnosing a problem, solving an issue and, if necessary, scheduling a visit with a technician. After sitting with agents, it was obvious that these well intentioned guides needed a content strategy and process refresh with added transparency. These wires reflect a 'choose-your-own-adventure' approach.